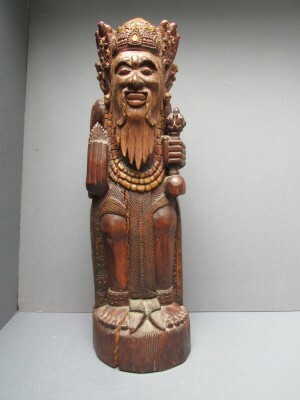 The Tropen Museum in Amsterdam has several of these old pedanda carvings. The staff is typical for these times. Because there were almost no tourists in early 20th century, this statue was made for decoration purposes for the village community. Probably for a temple or bale bale. The paint used on this carving is gold-paint. Many of these panels are made over the years in Bali. Some like this one, others of mothers with their babies. Most of them don't have the refinement of a Pita Maha carving, but were just made for the tourist market. This one has a very high quality in both carving skill as well as lay out. The maker clearly was looking for the ideal line in his art work. Something we in the West refer to as 'art deco'. The face is subdued but also mysterious. Very few decorative ornaments in this carving, which enhances the overall expression of this impressive art work. Pls click on the photo to get more info and photos. 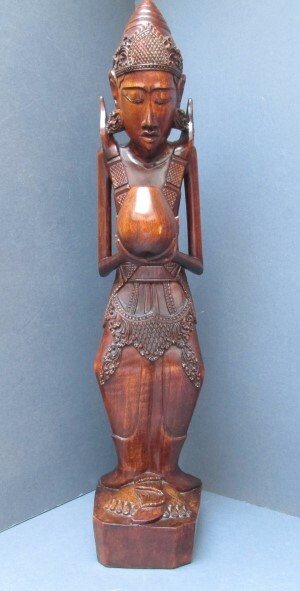 Wooden coloured statue of a female priest ("Pedanda Isteri"). On bali there are more female priests than male. They are treated equally. The Pedanda Isteri has 3 important tasks: every morning she prepares the holy water, she also prepares the offerings (banten), and she may lead a ceromony if called upon. When she leads a temple ceremony she has to be of the Brahmin caste. Some Pedanda Isteri are married to a male priest. 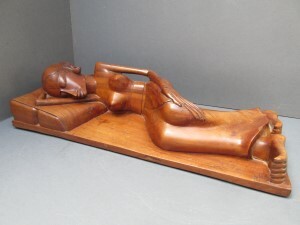 Rare statue, probably made in the time that Art Deco was in demand, hence the colouring (the colours used are typical for the art deco). Made in the thirties by a very talented anonymous artist. Most likely was this sculpture commissioned by a gallery or a foreign customer. Mother and child. 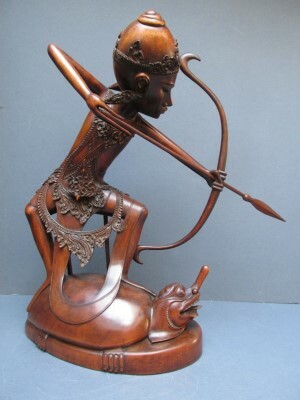 Wooden sculpture made on Bali. Exceptional long carving (very rare!). 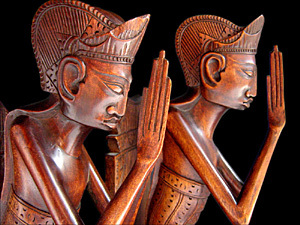 Carved in Art Deco, a style that just became known on Bali at that time. 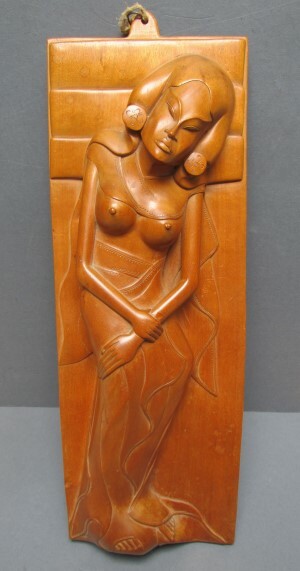 A similar carving was exhibited during the exhibition "ART DECO ON BALI" in the Nusantara Museum in Delft (Holland) in 2005. 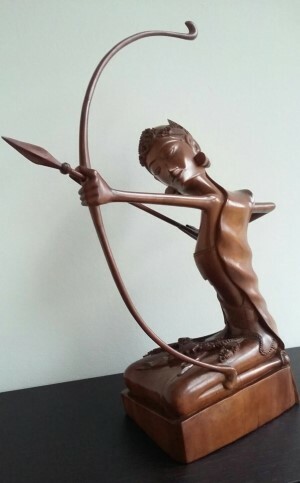 It was published in a book accompanying the exhibition "Art Deco Sculptures From Bali 1930-1970" written by Frans Leidelmeier (page 69). Pls click on each photo to see two larger images. 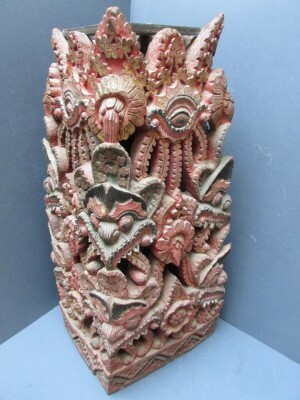 Wooden pillar post in the shape of a winged ganesha, made on Bali. Nice old sculpture with a practical purpose, besides its decorative function. On top of this sculpture is a gap in which a vertical pillar fits. 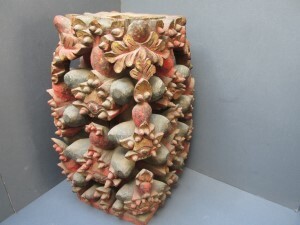 This pillar connects to a roof of a house or temple. The wings and tail are seperate pieces. Clearly NOT a tourist item. Excellent example of a very fine woodcarving technique. When more tourists came to Indonesia after the war, the demand for souvenirs increased considerably. Wooden busts were popular, because they had no protruding parts and were easy to take along in bags or suitcases. 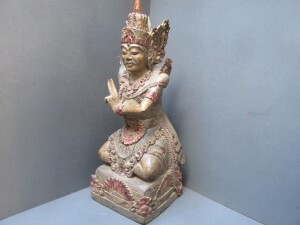 On Bali djanger busts were popular and mass produced. 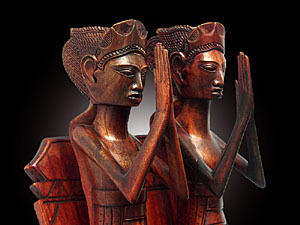 On Java the loro blonyo, a set of a female and a male bust, were popular as a gift to a newly wed couple. Single busts of a man or woman were less in demand, let alone single busts of young Indonesians. In that respect this bust is remarkable. 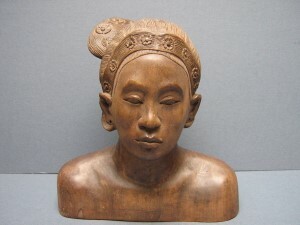 Bust of a typical Javanese woman in the Dutch Indies-era. One of the best Indonesian busts I've ever seen. Remarkable features and strong rendering of the hair. Made by a mastercarver. 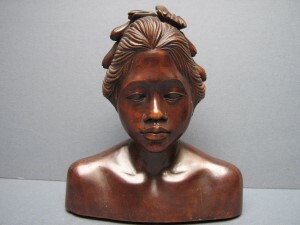 Whether this bust was made in Java or Bali is unclear. Sometimes these busts were made for local people to serve as a marriage present. Usually there is a male bust with it(loro blonyo). 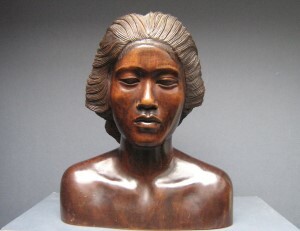 Rare bust of a Indonesian teenager. Rare bust, probably made on Java, but Bali is possible too. The type of wood is unusual too. 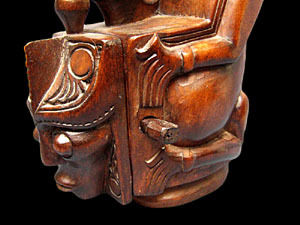 The density of the wood allows the carver greater detail, shown here in the facial features. Clicking on the photo will show more photos&info. 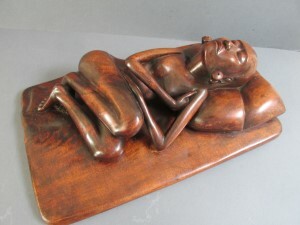 Maginficent grotesque carving of a sleeping lady. This panel was made by a mastercarver in the 1930s The difference with the panel Tobo 612 is the rough big manner in which this artwork has been made. Clearly the carver was trying to make an impression by looking for the bigger lines instead of going into detail. The result is enhanced by the unusual dimensions (44 cm) and the very dense and heavy wood that he used. Pls click on the photo to get more info and photos. 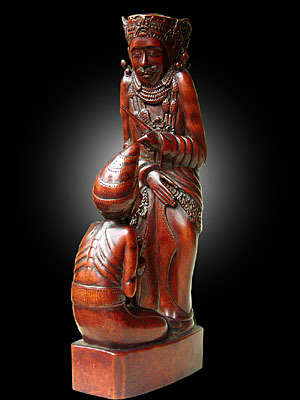 Wooden statue of the Hindu witch Rangda standing on one of her children. 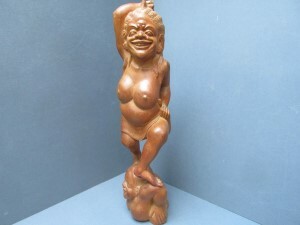 Unusual 1930s-woodcarving of the witch Rangda, the personification of evil in the Hindu religion. Rangda is often depicted as an old pregnant woman with long hair and an ugly face. 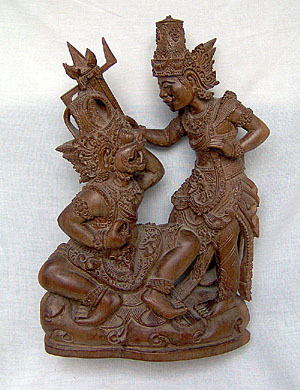 The meaning of Rangda standing on a child- may be related to an old Balinese folk-tale. Here Rangda wants her daughter Ratna Manggali to be married to an important person. However nobody wants to marry a daughter of a witch. Rangda takes that as an insult and wants revenge. She then goes to Durga, the demonical wife of Siwa and asks for advice. She advises her to go to the cemetery Gandamayu and dig up a body of a deceased child, which needs to be offered to Durga. Very subdued almost solemn statue. Vishnu sits on a stupa and has a mantra, a certain hand gesture in the Hindu mythology. This feature with the age factor is enough proof that this carving was NOT made for the tourists, but rather as a Hindu object to protect the visitor entering the temple. 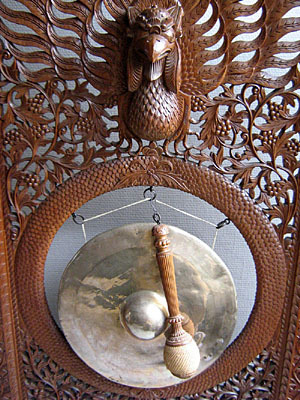 Most likely it was placed near a temple entrance in a prewar Balinese village. Real folk art! 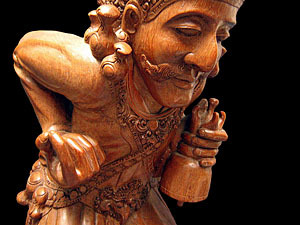 Wooden support, made on Bali in the 1930s. Nicely carved wooden support, either used as a support for a pillar as part of a bale bale, or as a support for a holy statue. 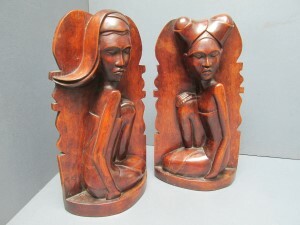 Wooden bookends, made on Bali period 1930-1950. Odd pair of bookends. The beautiful dark brown patina indicates an early production date. These bookends have 2 unusual features; the man and woman stare right at you(normally the stare is subdued and pointed down). Also the head scarf of both is unusual. Maybe this set was made in a remote part of Bali, away from the tourist trail. Well made antique mask, probably used for the kecak dance. The hair is real hair from a human being or horse. 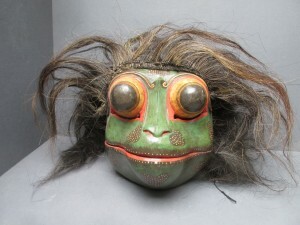 This was common in Bali for prewar masks. 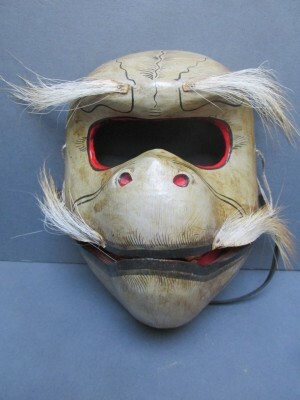 This mask was used during one of the many dances on Bali. A real collectible, this super mini carving. Just 13 cm(!) high, but carved with high skill and humour. Probably made in the little village of Njuh Kuning, close to Ubud in the center of Bali, where many animal carvings are produced. 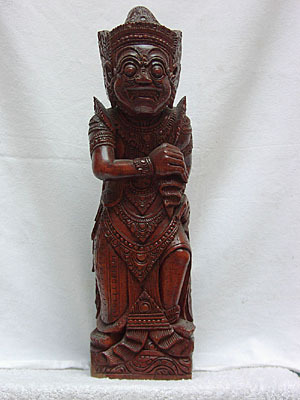 Very old and heavy carving of a Bali priest. He holds a flower and the priest bell (genta) with which he can perform religious acts. Because of its seize and weight this carving could not be a souvenir item. Probably it was made to decorate a temple. Big and massive carving of Garuda, the holy bird from the Hindu religion. 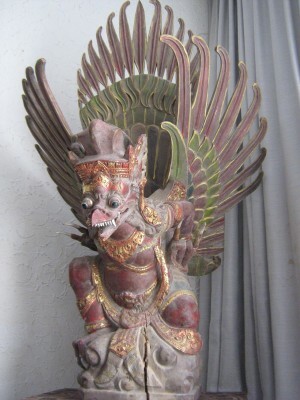 This Garuda was part of an exhibition in Boston (USA) featuring the prewar art on Bali. Impressive statue of Garuda, important figure in the Hindy mythology. 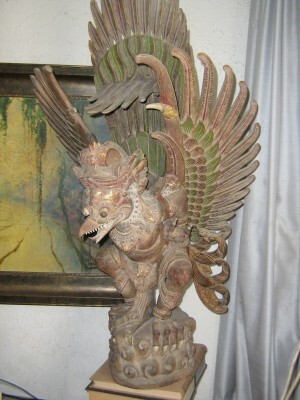 This garuda is made by the same carver as the garuda of Tobo 298. 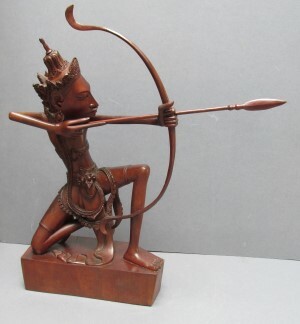 Remarkable is the fact that this statue has survived the transition from Bali to Holland better than the 298-item. Only some minor cracks. Over all in fine condition. 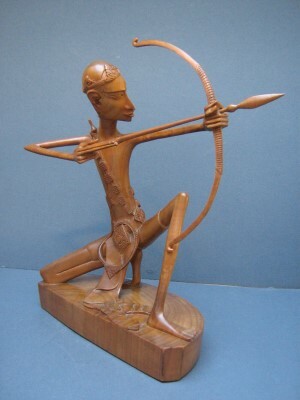 This archer has been carved in an unusual style. Most archers from the thirties have the bow and arrow pointed sideways or slightly up. 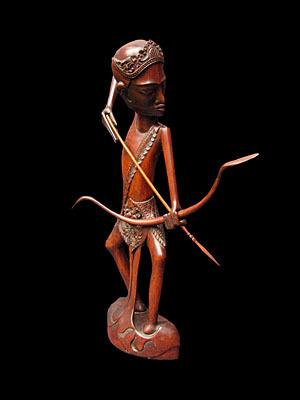 This archer points his arrow downwards. Also his standing up is rare. 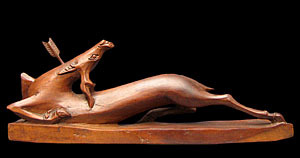 Usually most archer-carvings have the carver kneeling down. With this pose the artist wanted to increase the expressive power of his carving. Besides that this statue has the usual features of a 1930 carving; long fingers, the art deco lines and the detailed ornaments. A real collectable piece! Pls click on each photo to see two larger images. Bird sculpture with strong art deco features. The twisted neck is very difficult to execute. 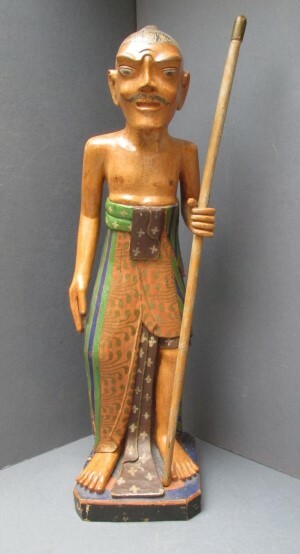 Very large statue of a standing Bali priest, made before 1940. this is a carving not made for the tourists, since the size makes it unpractical to carry. Maybe this statue was made for a temple or it was a special order for a priest. 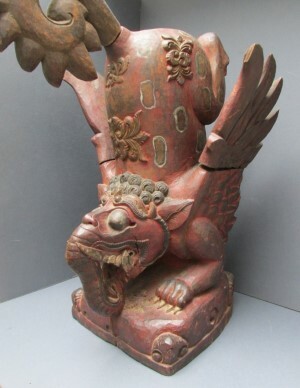 Well executed carvingmade in the period 1950-60. The carver undoubtedly had a meaning when he made this small carving. The sitting human figure has facial features of a human being and the holy Hindi god Ganesha. Bookends, in the shape of birds. 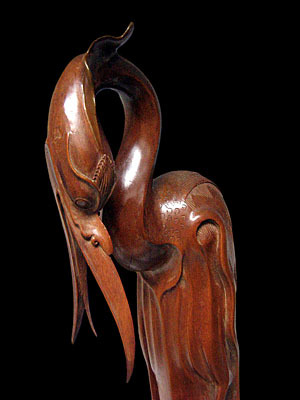 Birds bookends were a popular export product on Bali in the 1950s. Thousands were mass produced and that affected the quality considerably. These bookends however were made before the mass production began. This is noticeble at two differences when compared to the more general bookends. First the beak of the bird goes into the egg instead of around it. Secondly the back support is bent slighly backward, just like a row of books would do. Normally the back support is placed under a 90 degrees angle. Also the beautiful brown patin is proof that these bookends were made in the thirties. 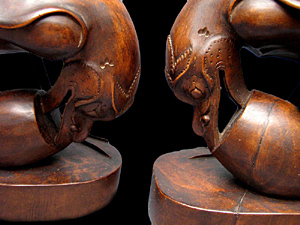 Wooden bookends made on Bali. Nice pair of bookends, executed in the Art Deco style. This pair is slightly different than the other pair in the Tobo Art collection (TOBO-00018). Pls click on each photo to see two larger images. 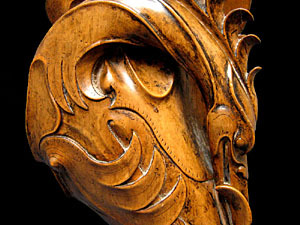 A remarkable object used in a school or workshop for student learning the trade of woodcarving. In 5 stages the creation of a Wayang-head is shown. A missionary brought this piece to Holland. Same kind of sculpture as TOBO-165 ,only this one is smaller. At the top a bird is depicted. Birdcarving with one wing upwards and twisted neck. Good well-detailed carving. 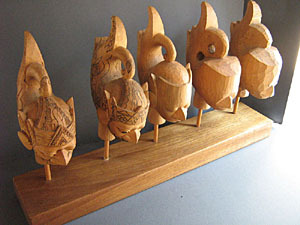 Probably made in the animal-woodcarving-village Njuh Kuhning near by Ubud. 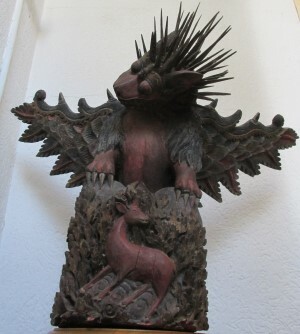 Their favourite animal must have been the bird when you consider the big number of bird-carvings all around the world. Striking is the somewhat odd lightbrown varnish and the rich ornamented wings. 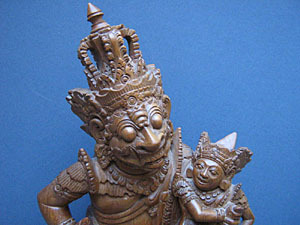 Rawana, the demon king from Ceylon, with Sita on his lap. Scene from a mythologic story. 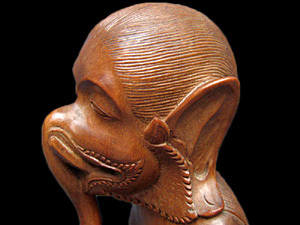 Wooden statue of a priest and his servant in the shape of a monkey. 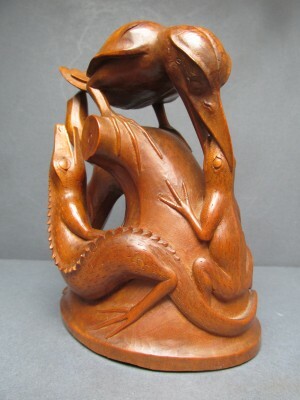 Magnificently carved statue of a somewhat mysterious scene. Probably it depicts a shiwa-priest with one of his servants, Baroeh in the shape of a monkey. Pls click on each photo to see two larger images. This is an important scene in Bali's daily life. from early morning to dawn the balinese bring offers in their houses and temples to please the good will of the gods. This motif has been used for these bookends. Pls click on each photo to see two larger images. Old sculpture probably made before 1930. In those times only sculptures like this were made for use in temples.